NO PURCHASE NECESSARY TO ENTER, WIN OR CLAIM A PRIZE. OPEN ONLY TO LEGAL RESIDENTS OF THE 48 CONTIGUOUS UNITED STATES AND THE DISTRICT OF COLUMBIA WHO ARE AT LEAST 18 YEARS OLD AT THE TIME OF ENTRY. VOID IN ALASKA, HAWAII, PUERTO RICO AND WHERE PROHIBITED OR RESTRICTED BY LAW.  The Serta Challenge Your Comfort Sweepstakes (“Sweepstakes”) is sponsored by Serta, Inc. (“Sponsor”), 2600 Forbs Avenue, Hoffman Estates, IL 60192. SWEEPSTAKES PERIOD: The Sweepstakes begins on June 19, 2018 at 10:00:01 AM (midnight) Central Time (“CT”) and ends on June 25, 2018, at 11:59:59 PM CT (“Sweepstakes Period”). ELIGIBILITY: This Sweepstakes is offered only to legal residents of the forty eight (48) contiguous United States and the District of Columbia who are at least eighteen (18) years old at the time of entry. Employees, officers, directors and agents of Sponsor, the third party responsible for the administration of this Sweepstakes (“Administrator”), Zeno Group, and each of their affiliates, subsidiaries, suppliers, advertising, promotion and marketing agencies (collectively, “Sweepstakes Entities”) and their immediate family members and/or those living in the same household of each (whether related or not) are not eligible. Void in Alaska, Hawaii, Puerto Rico, and where prohibited or restricted by law. All federal, state and local laws and regulations apply. Participation constitutes entrant’s full and unconditional agreement to these Official Rules and Sponsor and Administrator’s decisions, which are final and binding in all matters related to the Sweepstakes. Winning a prize is contingent upon fulfilling all requirements set forth herein. Entrants and/or potential winners will be required to provide proof of age, identification and eligibility as required by Sponsor or Administrator. If an entrant enters the Sweepstakes from a mobile device, the entrant’s wireless service provider may charge the entrant for applicable data charges. Entrants should consult their wireless service provider regarding its pricing plans. Message and data rates may apply. Entrants should review their mobile device’s capabilities for specific app instructions. Online Entry: An entrant must visit www.SertaComfortChallenge.com (“Website”) and submit the required registration information which may include, but is not limited to, complete first and last name (no initials), valid e-mail address, date of birth, and confirmation that he/she has read and agrees to these Official Rules. Upon submission of the registration information the entrant must then submit a photo or description not to exceed 1,000 characters of how he/she gets exceptionally comfortable to obtain one (1) Sweepstakes entry (“Online Entry”). Instagram Entry: An entrant may obtain one (1) additional entry by logging on to his/her Instagram account and posting an original photograph and sharing how he/she gets exceptionally comfortable and include the hashtags #SertaComfortable (“Instagram Entry”). Instagram Entries must be photographs posted during the Sweepstakes Period. An entrant may not add the hashtags #sertacomfortchallenge to a photograph posted prior to the Sweepstakes Period to enter the Sweepstakes. If there is evidence of an entrant using a photograph that is not their own, or from another entrant, the entry may be disqualified. Due to the way Instagram operates its service, Sponsor may not receive Instagram Entries from Instagram users with “private” profiles, (i.e., an Entrant has set his/her account so that only people the Entrant has approved can view his/her photos). Entrant must make sure the “Photos Are Private” option in the account settings on his/her Instagram account are set to “OFF” in order to enter. NOTE: By submitting an Entry, each entrant agrees that his/her Entry conforms to the Entry Requirements set forth above and that Sponsor or Administrator may, at its sole and absolute discretion, disqualify him/her from the Sweepstakes if Sponsor decides that his/her Entry fails to conform to the such requirements or any other provision of these Official Rules. Each entrant acknowledges that other Entrants may have used ideas and/or concepts in their Entry that may be similar in idea or concept to what is included in entrant’s Entry. Each entrant understands and agrees that he/she shall not have any claim against any other entrant or Sponsor arising out any such similarity or be entitled to any compensation because of any such similarity. Any Entry that does not comply with these Official Rules or that otherwise contains prohibited or inappropriate content as determined by Sponsor, in its sole and absolute discretion, will be disqualified, and if posted on websites and/or platforms related to this Sweepstakes, removed there from. Sponsor grants entrants a limited, revocable, non-sublicensable, and non-transferable license to use Sponsor’s name, product, trademarks and logos as related to its brand (collectively, “Sponsor’s IP”) for the sole purpose of entering this Sweepstakes. Entrants are not permitted to make any other use of Sponsor’s IP under any circumstances, and have no other rights whatsoever in the Sponsor’s IP. In addition, By entering the Sweepstakes, entrant agrees that: (a) all rights, titles and interests in Sponsor’s IP, and all goodwill related thereto, belong exclusively to Sponsor, (b) entrant has not and will not take any action that might harm or adversely affect such rights, (c) no rights, titles or interests in and to the Sponsor’s IP, except for the limited license granted to entrant in these Official Rules, are transferred or created hereby, (d) Sponsor’s IP rights are valid and enforceable, and that entrant will do nothing to challenge the validity or enforceability of Sponsor’s IP in any forum, and (e) the use of Sponsor’s IP is permitted only for the purpose of making a submission in this Sweepstakes and any use of Sponsor’s IP (whether in an Entry or otherwise) that exceeds the scope of this limited license infringes the rights of Sponsor and will result in irreparable harm to Sponsor. RANDOM DRAWINGS: On or about June 29, 2018, Sponsor’s designee will randomly select seven (7) potential “Winners” from among all eligible entries received during the applicable Entry Period. Each winner is considered a potential winner pending verification of his/her eligibility and compliance with these Official Rules. Prizes: Each of the seven (7) Winners will receive a queen size Serta iComfort Hybrid Blue Fusion 3000.  Serta iComfort® mattress includes his/her choice of plush or firm models (“Prize”). The approximate retail value (“ARV”) of the Entry Period 1 First Prize is up to $2,499.00. Odds of Winning: The odds of winning a prize depend on the total number of eligible Entries received during an Entry Period. The odds of winning the Grand Prize depend on the total number of eligible Entries received during the entire Sweepstakes Period. General Prize Conditions: In no event will more prizes than allotted for in these Official Rules be awarded. If, for any reason, more prize notifications are sent (or more claims are received), Sponsor reserves the right to award the prizes in a random drawing from among all prize claims received. The right to receive a prize is non-assignable, non-transferable and no prize substitution, exchange or cash equivalent will be allowed, except by Sponsor who reserves the right to substitute a prize of equal or greater value in case of unavailability of prize or force majeure. No substitutions, cash equivalents or transfers of a prize permitted by a winner. Neither Sponsor, Administrator or any Sweepstakes Entities shall be responsible for any inability of a winner to accept or use any portion of a prize for any reason. Federal, state and local taxes are solely the responsibility of each winner. All other costs and expenses not expressly set forth herein shall be solely the winner’s responsibility. The Sweepstakes Entities shall not be held responsible for any delays in awarding the prize for any reason. If, after a good-faith attempt, Sponsor is unable to award or deliver the prize, the prize may not be re-awarded, in Sponsor’s sole discretion. HOW TO CLAIM THE PRIZE: Each potential winner is subject to verification of eligibility and compliance with these Official Rules. Within two (2) business days from the Random Drawing Date after the Entry Period, each potential winner will be notified by Sponsor or its designee (the “Notification”). If the potential winner entered on the Website, the Notification will be sent to the e-mail address submitted when registering for the Sweepstakes. If the potential winner entered on Instagram, the Notification will be sent via Direct Message on Instagram by SertaMattress. The potential winner must then respond to a Notification on Instagram within 48 hours and provide his/her complete first and last name (no initials), date of birth, and e-mail address. If the potential winner did not register for the Sweepstakes at the Website, he/she must also provide his/her mailing address (no PO boxes). Before being declared a winner of a prize valued over $600, he/she will be required to execute and return an Affidavit of Eligibility/Liability & Publicity Release, rights transfer document, a tax acknowledgment form, and, in the case of the potential Grand Prize Winner, a written authorization for background check (collectively, the “Verification Documents”) no later than five (5) calendar days after receipt of the Verification Documents or the prize may (in Sponsor's sole discretion) be forfeited. The Verification Documents will be sent to the e-mail address submitted when registering for the Sweepstakes or provided during Notification. Additionally, each potential winner may be required to submit releases from any and all third parties appearing in his/her Entry. The Verification Documents will be e-mailed to each potential winner at the e-mail address provided to Sponsor at the time of Sweepstakes registration or during initial winner notification. Upon verification of eligibility, Sponsor or its designee will ship prizes (other than mattress prizes) to winners at the street address provided during Sweepstakes registration within 6 – 8 weeks. Upon verification of eligibility, Sponsor or its designee will schedule mattress prize delivery with each winner, and delivery must be taken at the mutually agreed upon time. If winner cannot take mattress delivery at the mutually agreed upon time, he/she may be responsible for payment of redelivery fees, at Sponsor’s sole discretion. Upon verification of eligibility, Sponsor or its designee will contact the Grand Prize Winner to schedule the interior designer bedroom makeover. Sponsor will attempt to notify the potential winners as set forth above, but Sponsor is not responsible for any undelivered e-mails, including without limitation e-mails that are not received because of a winner’s privacy or spam filter settings which may divert any Sweepstakes e-mail, including any winner notification e-mail to a spam or junk folder. If any potential winner is found to be ineligible or not in compliance with these Official Rules, fails to respond to Sponsor’s notification on e-mail, Instagram within 48 hours, fails to return the signed Verification Documents (if required for prize) within five (5) calendar days, or declines to accept the prize, Sponsor or Administrator is unable to contact a potential winner, or any prize notification or prize is returned undeliverable, the prize will be forfeited. If the Sponsor wishes to select an alternative potential winner, Sponsor will select this alternative potential winner at random from the pool of remaining eligible Entries for that Entry Period. Each potential winner may be required to furnish proof of identification and other proof of eligibility under these Official Rules. Each prize will only be awarded to a verified winner. LIMITATION OF LIABILITY: By participating in this Sweepstakes, entrants agree that the Sweepstakes Entities, Instagram, LLC, and each of their respective affiliates, subsidiaries, representatives, consultants, contractors, legal counsel, advertising, public relations, promotional, fulfillment and marketing agencies, website providers, Web masters and their respective officers, directors, employees, representatives, designees and agents (“Released Parties”) are not responsible for lost, late, incomplete, stolen, misdirected, postage due, or undeliverable e-mail notifications or postal mail; or for any computer, telephone, satellite, cable, network, electronic or Internet hardware or software malfunctions, failures, connections or availability; or garbled, corrupt or jumbled transmissions, service provider/Internet/website/use net accessibility, availability or traffic congestion; or any technical, mechanical, printing, or typographical or other error; or unauthorized human intervention; or the incorrect or inaccurate capture of registration information; or the failure to capture, or loss of, any such information. The Released Parties are not responsible for any incorrect or inaccurate information, whether caused by any website users, tampering, hacking or by any of the equipment or programming associated with or utilized in the Sweepstakes and assume no responsibility for any error, omission, interruption, deletion, defect, delay in operation or transmission, communications line failure, technical error, theft or destruction or unauthorized access to any Sweepstakes-related website(s). The Released Parties are not responsible for any injury or damage, whether personal or property, to participants or to any person's computer related to or resulting from participating in the Sweepstakes and/or accepting or using a prize. The Released Parties shall not be responsible or liable for Entries that are entered by any automated computer, program, mechanism or device, for any Entries in excess of the stated limit or for Entries that are late, forged, lost, misplaced, misdirected, tampered with, incomplete, deleted, damaged, garbled or otherwise not in compliance with the Official Rules, and all such Entries may, in Sponsor’s sole discretion, be disqualified. If, for any reason, the Sweepstakes is not capable of running as planned, Sponsor reserves the right, in its sole discretion, to cancel, terminate, modify or suspend the Sweepstakes and/or proceed with the Sweepstakes, including the selection of the winner(s) in a manner it deems fair and reasonable including the selection of the winner(s) from among eligible Entries received prior to such cancellation, termination, modification or suspension. In no event will more prizes be awarded than are stated in these Official Rules. In the event that, due to technical, typographical, mechanical or other errors, there are more winners than are stated in these Official Rules, a random drawing among the claimants will be held to determine the winners. If for any reason, including but not limited to an administrative, printing, production, computer or other error or due to technical difficulties or incorrect announcements of any kind, more winning messages are distributed, or more prizes are claimed than are intended to be awarded according to these Official Rules, the intended prizes will be awarded in a random drawing from among all verified prize claims received. By entering the Sweepstakes, each entrant agrees: (i) to be bound by these Official Rules and by all applicable laws and by the decisions of Sponsor and Administrator, which shall be binding and final; (ii) to waive any rights to claim ambiguity with respect to these Official Rules; (iii) to waive all of his or her rights to bring any claim, action or proceeding against any of the Released Parties in connection with the Sweepstakes; and (iv) to forever and irrevocably agree to release and hold harmless each of the Released Parties from any and all claims, lawsuits, judgments, causes of action, proceedings, demands, fines, penalties, liability, costs and expenses (including, without limitation, reasonable outside attorneys’ fees) that may arise in connection with: (a) the Sweepstakes, including but not limited to any Sweepstakes-related activity or element thereof, and the entrant’s Entry, participation or inability to participate in the Sweepstakes, (b) the violation of any third-party privacy, personal, publicity or proprietary rights, (c) typographical or printing errors in these Official Rules or any Sweepstakes materials, (d) acceptance, attendance at, receipt, travel related to, participation in, delivery of, possession, defects in, use, non-use, misuse, inability to use, loss, damage, destruction, negligence or willful misconduct in connection with the use of a prize (or any component thereof), (e) any change in the prizing (or any components thereof) due to unavailability or due to reasons beyond Sponsor’s control, including but not limited to by reason of any acts of God, any action(s), regulation(s), order(s) or request(s) by any governmental or quasi-governmental entity (whether or not such action(s), regulation(s), order(s) or request(s) prove(s) to be invalid), equipment failure, threatened or actual terrorist acts, earthquake, war, fire, flood, explosion, unusually severe weather, hurricane, embargo, labor dispute or strike (whether legal or illegal), labor or material shortage, transportation interruption of any kind, work slow-down, civil disturbance, insurrection, riot or any other cause beyond any of the Released Parties’ control, or as otherwise permitted in these Official Rules, (f) any interruptions in or postponement, cancellation or modification of the Sweepstakes, (g) human error, (h) incorrect or inaccurate transcription, receipt or transmission of any part of any Entry, (i) any technical malfunctions or unavailability of the Website or any telephone network, computer system, computer online system, mobile device, computer timing and/or dating mechanism, computer equipment, software, or Internet service provider, or mail service utilized by any of the Released Parties or by an entrant, (j) interruption or inability to access the Sweepstakes, including any Sweepstakes-related websites or any online service via the Internet due to hardware or software compatibility problems, (k) any damage to entrant’s (or any third person’s) equipment used to access the Sweepstakes and/or its contents related to or resulting from any part of the Sweepstakes, (l) any lost/delayed data transmissions, omissions, interruptions, defects, and/or any other errors or malfunctions, (m) any late, lost, stolen, mutilated, misdirected, delayed, garbled, corrupted, destroyed, incomplete, undeliverable or damaged Entries, (n) any wrongful, negligent, or unauthorized act or omission on the part of any of the Released Parties, (o) lost, late, stolen, misdirected, damaged or destroyed prizing (or any element thereof), or (p) the negligence or willful misconduct by entrant. Without limiting the foregoing, everything regarding this Sweepstakes, including the prize components, are provided “as is” without warranty of any kind, either express or implied, including but not limited to, the implied warranties of merchantability, fitness for a particular purpose or non-infringement. Some jurisdictions may not allow the limitations or exclusions of liability for incidental or consequential damages or exclusions of implied warranties, so some of the above limitations or exclusions may not apply. Check local laws for any restrictions or limitations regarding these limitations or exclusions. DISPUTES: THIS SWEEPSTAKES IS GOVERNED BY, AND WILL BE CONSTRUED IN ACCORDANCE WITH, THE LAWS OF THE STATE OF MICHIGAN, AND THE FORUM AND VENUE FOR ANY DISPUTE SHALL BE IN OAKLAND COUNTY, MICHIGAN. IF THE CONTROVERSY OR CLAIM IS NOT OTHERWISE RESOLVED THROUGH DIRECT DISCUSSIONS OR MEDIATION, IT SHALL THEN BE RESOLVED BY FINAL AND BINDING ARBITRATION ADMINISTERED BY THE AMERICAN ARBITRATION ASSOCIATION IN ACCORDANCE WITH ITS ARBITRATION RULES AND PROCEDURES OR SUBSEQUENT VERSIONS THEREOF (“AAA RULES”). THE AAA RULES FOR SELECTION OF AN ARBITRATOR SHALL BE FOLLOWED, EXCEPT THAT THE ARBITRATOR SHALL BE EXPERIENCED AND LICENSED TO PRACTICE LAW IN MICHIGAN. ALL PROCEEDINGS BROUGHT PURSUANT TO THIS PARAGRAPH WILL BE CONDUCTED IN OAKLAND COUNTY, MICHIGAN. THE REMEDY FOR ANY CLAIM SHALL BE LIMITED TO ACTUAL DAMAGES, AND IN NO EVENT SHALL ANY PARTY BE ENTITLED TO RECOVER PUNITIVE, EXEMPLARY, CONSEQUENTIAL OR INCIDENTAL DAMAGES OR HAVE DAMAGES MULTIPLIED OR OTHERWISE INCREASED, INCLUDING ATTORNEY’S FEES OR OTHER SUCH RELATED COSTS OF BRINGING A CLAIM, OR TO RESCIND THIS AGREEMENT OR SEEK INJUNCTIVE OR ANY OTHER EQUITABLE RELIEF. ENTRANTS AGREE THAT THE RIGHTS AND OBLIGATIONS OF ANY ENTRANT AND/OR SWEEPSTAKES ENTITIES AND/OR ANY OTHER PARTY SHALL BE RESOLVED INDIVIDUALLY, WITHOUT RESORT TO ANY FORM OF CLASS ACTION. ANY DEMAND FOR ARBITRATION MUST BE FILED WITHIN ONE (1) YEAR OF THE TIME THE CAUSE OF ACTION OCCURRED, OR THE CAUSE OF ACTION SHALL BE FOREVER BARRED. Further, entrants hereby waive all rights, to: (i) claim punitive, exemplary, special, incidental, indirect and consequential damages and any other damages (whether due to negligence or otherwise), other than for actual out-of-pocket costs; and (ii) have damages multiplied or otherwise increased. Entrants agree that the rights and obligations of any entrant and/or Sweepstakes Entities and/or any other party shall be resolved individually, without resort to any form of class action. PUBLICITY RIGHTS: By participating in the Sweepstakes, and if applicable, accepting a prize, each entrant agrees to allow Sponsor and/or Sponsor's designee the perpetual right to use his or her name, biographical information, photos and/or likeness, and statements for promotion, trade, commercial, advertising and publicity purposes, at any time or times, in all media now known or hereafter discovered including live television, worldwide, including, but not limited to, on the World Wide Web and Internet, without notice, review or approval and without additional compensation except where prohibited by law. GENERAL: Any attempted form of participation in this Sweepstakes other than as described herein is void. If it is discovered or suspected in Sponsor’s sole and absolute discretion that an entrant has registered or attempted to register more than once using multiple e-mail addresses, accounts, multiple identities, proxy servers or like methods, all of that entrant’s Entries (if any) will be declared null and void, and that entrant will be ineligible to win a prize. Also, if it is discovered that any entrant attempts to receive additional Entries in excess of the stated limitation, that entrant may, in Sponsor’s sole discretion, be disqualified from the Sweepstakes. In the event of a dispute as to the identity of a winner, the winning Entry will be declared made by the authorized account holder of the e-mail address associated with the Entry or the Instagram account used to submit such Entry. "Authorized account holder" is defined as the natural person who is assigned to an e-mail address by an Internet access provider, online service provider or other organization (e.g., business, educational institution) that is responsible for assigning e-mail addresses for the domain associated with the submitted e-mail address. Sponsor and Administrator reserve the right to disqualify any individual found, in its sole opinion, to be tampering with the operation of the Sweepstakes, to be acting in violation of these Official Rules or to be acting in an unsportsmanlike manner or with the intent to disrupt the normal operation of a Sweepstakes. Any use of robotic, automatic, macro, programmed, third-party or like methods to participate in the Sweepstakes will void any attempted participation affected by such methods and the disqualification of the individual utilizing the same. CAUTION AND WARNING: ANY ATTEMPT TO DELIBERATELY DAMAGE ANY WEBSITE OR TO UNDERMINE THE LEGITIMATE OPERATION OF THIS SWEEPSTAKES IS A VIOLATION OF CRIMINAL AND CIVIL LAWS. SHOULD SUCH AN ATTEMPT BE MADE, THE SPONSOR RESERVES THE RIGHT TO SEEK DAMAGES OR OTHER REMEDIES FROM ANY SUCH PERSON(S) RESPONSIBLE FOR THE ATTEMPT TO THE FULLEST EXTENT PERMITTED BY LAW. If any provision of these Official Rules or any word, phrase, clause, sentence, or other portion thereof should be held unenforceable or invalid for any reason, then that provision or portion thereof shall be modified or deleted in such manner as to render the remaining provisions of these Official Rules valid and enforceable. The invalidity or unenforceability of any provision of these Official Rules or the prize documents will not affect the validity or enforceability of any other provision. Sponsor’s and/or Administrator’s interpretation of these Official Rules is final and binding in all matters related to the Sweepstakes. Sponsor’s failure to enforce any term of these Official Rules shall not constitute a waiver of that provision and such provision shall remain in full force and effect. All Entries and/or materials submitted become the property of Sponsor and will not be returned. In the event of any conflict with any Sweepstakes details contained in these Official Rules and Sweepstakes details contained in any promotional materials (including but not limited to point of sale, television and print advertising, promotional packaging and other promotional media), the details of the Sweepstakes as set forth in these Official Rules shall prevail. WINNERS LIST: To obtain a list of winners, mail a self-addressed, stamped business-sized envelope to: Serta Comfort Challenge Sweepstakes - Winners List Request, Attn: Ashley Sanders, 130 E. Randolph St., 30th floor, Chicago IL 60601. Winners List requests must be received by August 31, 2018. 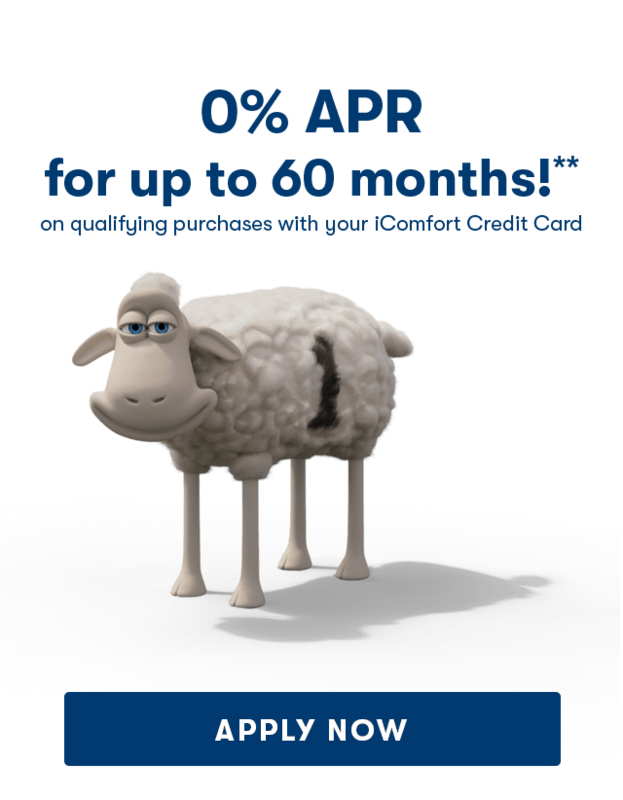 Sponsor: Serta, Inc., 2600 Forbs Avenue, Hoffman Estates, IL 60192. © 2017 Serta, Inc. All Rights Reserved. Instagram® is a registered trademark of Instagram, LLC. All rights reserved. The Sweepstakes is in no way sponsored, endorsed or administered by, or associated with Instagram, and neither Instagram have no responsibility or liability regarding the conduct or administration of the Sweepstakes or prizes.